The file O1_Textbeak_invers_320kbps.mp3 identified by urn:sha1:GJA4SGOWV7XVAOAFC2D52PZHOPED3QP3 is licensed to the public under the Paternité-Pas d'Utilisation Commerciale-Partage des Conditions Initiales à l'Identique 3.0 Unported license. The file O7_Textbeak_kraitr_320kbps.mp3 identified by urn:sha1:QQJKJAZ5VPAUBKS7PNPC33SDAL5DGDNA is licensed to the public under the Paternité-Pas d'Utilisation Commerciale-Partage des Conditions Initiales à l'Identique 3.0 Unported license. The file O2_Textbeak_grotesque_320kbps.mp3 identified by urn:sha1:2KXXJB2BU77UIQH6N5WQWUXFSNAIAALQ is licensed to the public under the Paternité-Pas d'Utilisation Commerciale-Partage des Conditions Initiales à l'Identique 3.0 Unported license. The file O3_Textbeak_dirty hed_320kbps.mp3 identified by urn:sha1:Z4QESIUAS4MO63QJTGE7U5KQE4C635VH is licensed to the public under the Paternité-Pas d'Utilisation Commerciale-Partage des Conditions Initiales à l'Identique 3.0 Unported license. 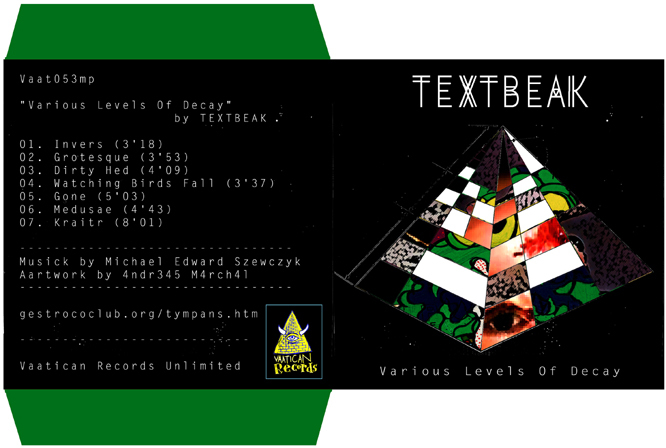 The file O4_Textbeak_watching birds fall_320kbps.mp3 identified by urn:sha1:VTBYEAQK7L25DA2LVWXHQ3NCLA66IWIB is licensed to the public under the Paternité-Pas d'Utilisation Commerciale-Partage des Conditions Initiales à l'Identique 3.0 Unported license. The file O5_Textbeak_gone_320kbps.mp3 identified by urn:sha1:5HEXXWHSUFA6YSUFPQAHK6H6UGHTUIOW is licensed to the public under the Paternité-Pas d'Utilisation Commerciale-Partage des Conditions Initiales à l'Identique 3.0 Unported license. The file O6_Textbeak_medusae_320kbps.mp3 identified by urn:sha1:T27YO6QBNSBDOVEHWPGMN4L3HFKN6C3C is licensed to the public under the Paternité-Pas d'Utilisation Commerciale-Partage des Conditions Initiales à l'Identique 3.0 Unported license.